The library is quite stable now, I've been using it in two different projects. 3D based version of the container is available but unfortunately, Silverlight is not supported at this time. But this article is not about that so let me explain how to host Silverlight in your Windows application as a resource. There are two ways you can use Silverlight in your C++ application. One method involves using an external resource which can be a file (file:///) or HTTP resource (http://). The second method access a Silverlight animation from your application resource. This is more advanced but can be used to completely hide your .xap file (this is a .zip file) from preying eyes! You can host Silverlight ActiveX control in the container simply by inserting the control to the dialog surface. As I've explained in my previous post about ActiveX hosting. You can safely rename your base class from CAxDialogImpl to CAxWindowlessHost. This class inherits from CDialogImplBaseT, thus, will have the same capabilities as any Windows dialog. Typically, the following code is all you need. Under some scenarios, you may want to embedded your Silverlight application in a Windows resource DLL. This section will show you how to proceed. Due to security restrictions, you can't use a resource moniker (res://). But here's what is possible (as of version 2.0). You can host the control by implementing the IXcpControlHost2 interface. With this interface, the resource can be loaded from your own storage and simply pass an IStream data object to the control. My proposed method to do this is to use a file URL to point to your application resource and then, load the resource manually when Silverlight calls the DownloadUrl method. The only drawback to this method is the fact you need to handle WM_LBUTTONUP and set the focus to the control manually. 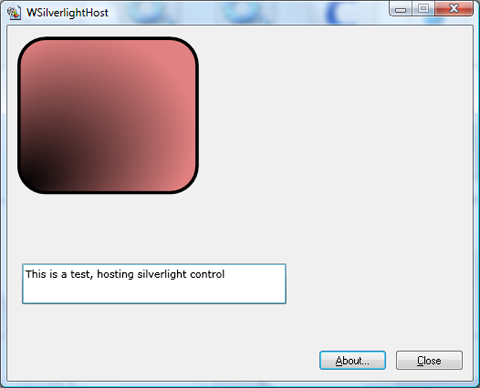 The Silverlight ActiveX control will no longer grab the focus when you implement this interface. //        #resource is your resource number (e.g. :#1001) which represents your .xap resource file. The method GetResourceData loads and copies the resource to memory. This article shows how you can use the WindowlessMedia library to host Silverlight as a resource. The steps are still very straightforward. Hopefully, you will find this information useful for your need. Of course, feel free to use the feedback page if you have a question about this library.